Just STOP IT! Right now … whatever it is … whatever you are doing … whatever you are saying … whatever you are thinking about … in your own life or anyone else’s life that isn’t positive or life affirming … STOP IT! Those of us who believe in a God believe that when God breathed life into us there was some divinity in that breath. Hence, there is some of God in all of us. That is what I define as one’s spirit. And It is that spirit that connects us all to everything else and vice versa … plants, animals, trees, earth, water, stars … and yes, even and especially, each other. I recently learned of the death of someone I didn’t know but knew of. We weren’t close at all. I didn’t know if she was married or if she had children or any of that … our “conversations” consisted of nothing more than the pleasantries exchanged in passing. I seem to remember meeting her once and shaking hands as I was exiting an elevator she was preparing to enter. Suffice it to say, our day- to- day interactions were limited. She worked on her part of the puzzle and I worked on mine. We, together with everyone else we worked with were helping to create the “big picture”. There is no “big” job or “small” job … there is only “our” job. In the case of higher education, all of “our” jobs are about creating a safe, healthy, life affirming and capable space for future leaders to be groomed and released to change the world. For those of you in another field, you have your “big picture” and whatever that picture is, be certain discord, chaos, “mean speak” or anything that isn’t life affirming is NOT part of it. But I digress. With the exception of what I felt to be her spirit when we met, I really hadn’t learned this person well enough to remember anything most would consider substantive. However, I DO remember what helped short circuit my learning was the residue … the remnants of “mean speak” and skepticism concerning the extended period of leave she had taken. But I have come to learn much more about her. I learned she was strong … much stronger than the mean spirited words spoken about her or those who spoke them. I learned she was a fighter. I learned she had already survived at least one bout with cancer before she came to us and, after a brief respite, she was in the throes of yet another battle with what had become stage 4 cancer. I learned she must have known the type of environment she needed to be in to heal and knew she knew she wasn’t in it … and it was while fighting this battle she found need for an extended period of leave. I learned on the tail end of that leave she suffered a brain hemorrhage and some paralyzation as a result. She survived all of that and now, little more three years after our meeting at the elevator, I learned she is gone. No more pain … no more fighting … only Glory. Though I didn’t know her, I felt I had met her spirit. I believe our spirits connected in that brief clasping of hands at the elevator. There was something about her countenance … something that conveyed the divinity that God deposits in us all with that breath. No, it doesn’t always translate as jovial or what many would consider “approachable”; at times, it may be pious or stoic … but however God’s spirit shows up, its energy is unmistakably sure and true. I believe we all are in possession of that energy. In some, it bursts forth almost daily and you can feel it. You see them and you begin to feel better. In others, the vicissitudes of life seem to have been piled high atop that energy by feeding doubt, sowing seeds of cynicism and speaking words that are indicative of where they are in life or how they feel. Whether the energy is good or bad, we project that – sometimes knowingly but most times not – onto those we share life with … in our homes … in our places of work … in all of our interactions, we put that energy out into the world. All that I am saying is, words matter. Be aware. 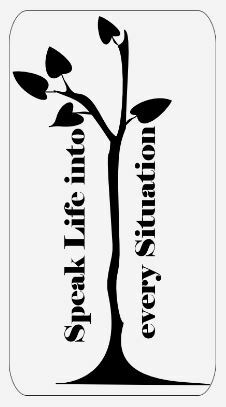 Speak life. Choose to be blessed!